We offer a range of suppression systems and can assist with all aspects of the design and installation as well as ongoing service and maintenance. There are a number of factors to consider when choosing the correct suppressant for an enclosure however our team of in-house experts will be more than happy to discuss the best options. Different types of suppression system are in our product portfolio such as Dry Powder, Chemical Gases/Wet Agent, Inert Extinguishing Agents, Carbon Dioxide, Water Mist, Foam etc. 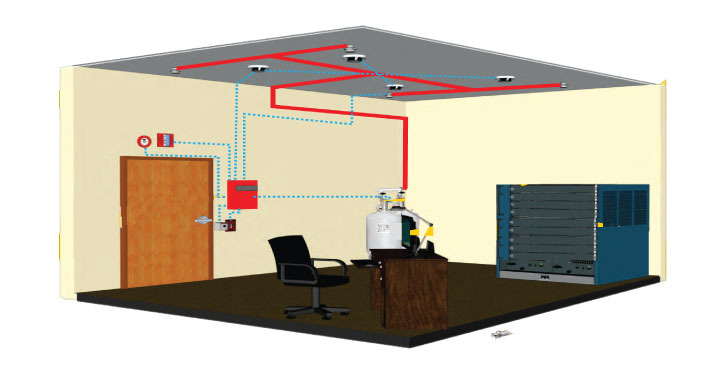 Fire Suppression Systems are manufactured using only top quality products, the unique cylinder heads are designed to incorporate a pressure gauge, a valve for pressurizing and allow a multiple of additional features if required such as pressure switches which activate audible or visual alarms or can be installed to de-activate the machine itself. FM200 Gas – used for electrical cabinets, computer servers etc. FM200 has been adopted by the majority of the world’s fire protection companies and it is the most widely used clean fire agent fire suppressant. Its applications include the protection of computer suites and telecommunications facilities including high asset protection. Carbon dioxide – used to protect power plants, oil refineries and electronic processes also including remote switch rooms, generators and oil quench tanks. 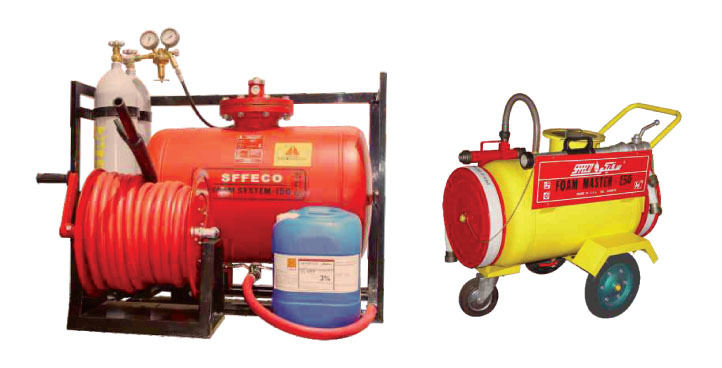 Foam System unit is constructed with a heavy duty tank with corrosion proof coating. Two external nitrogen cylinders are provided for pressurizing the tank. Various selections of hoses or nozzles are available.Custom size designs are available with tank capacities and hose reels. Pressure gauge is available to indicate the System pressure.